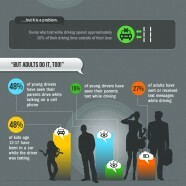 Teens and adults are texting or talking behind the wheel. 5 seconds of distractive driving are enough to cause a crash. See the facts.